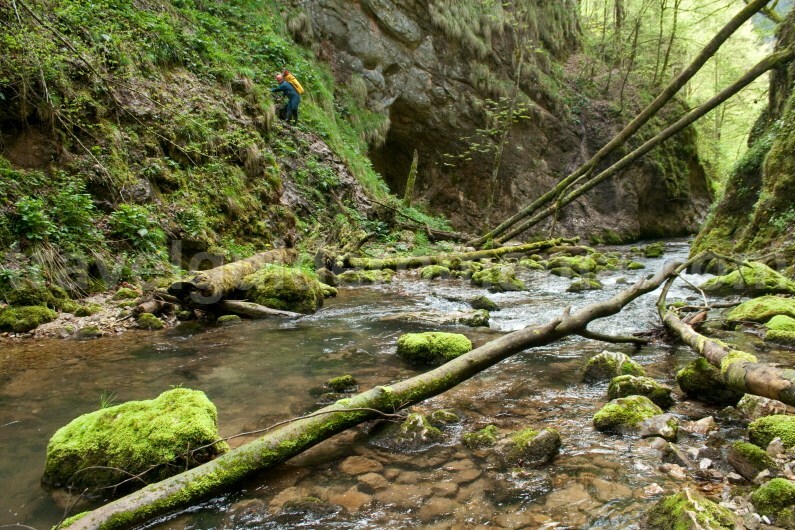 Galbenei Gorges (the Yellow Gorges) and Galbenei Canyon (the Yellow Canyon) are the most important surface karst phenomena in the Apuseni Mountains. If the Galbenei Gorges can be covered by any experienced tourist, there is a different story when it comes to the canyon. 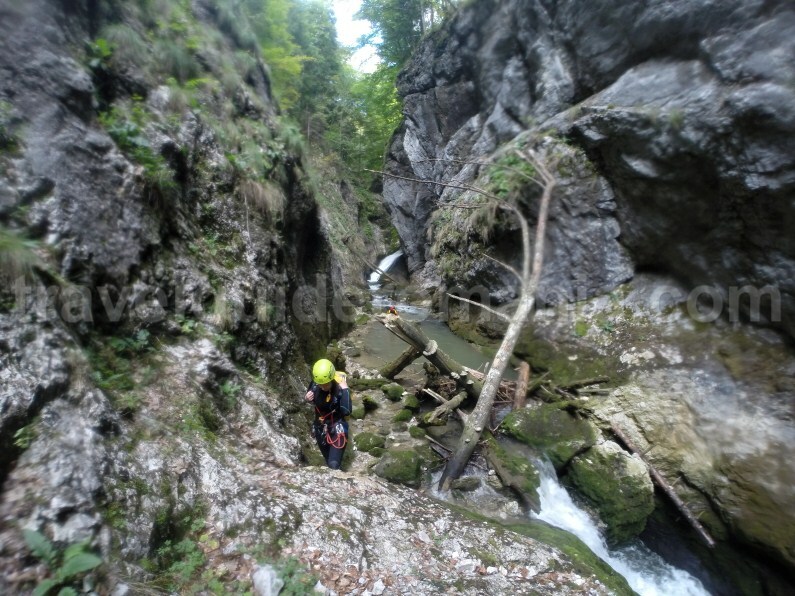 The Yellow Canyon can be covered only by using canyoning equipment and techniques. 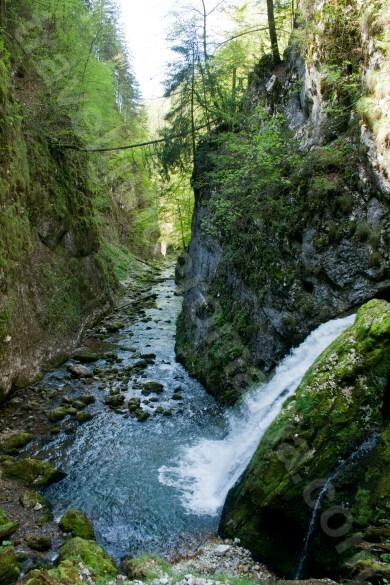 The canyon contains 9 waterfalls, the last of them being Cascada Evantai (the Fan Waterfall), located in close proximity to the trail marking. 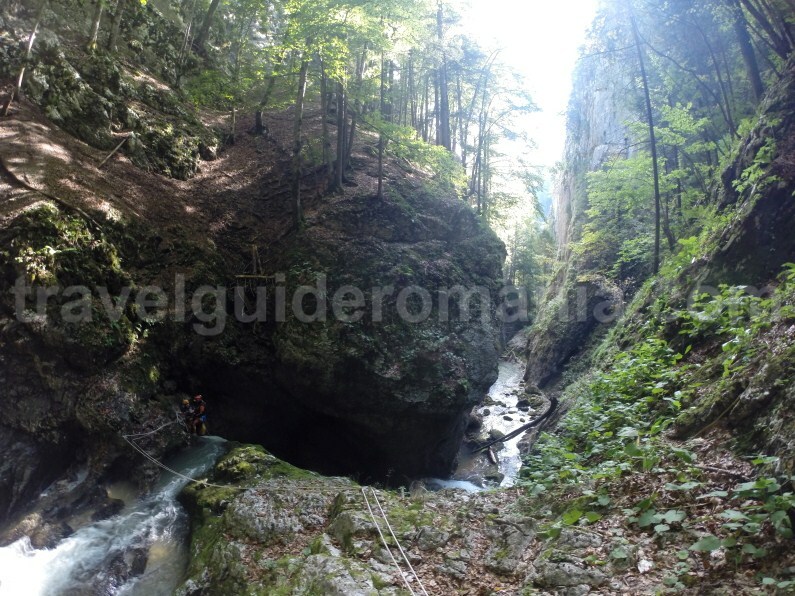 The Galbenei Valley cuts deep into the limestone massif, creating one of the most monumental gorges in the mountains of Romania. There are landscapes with hundreds of meters of rock walls, natural arches, caves with entrances that open in the middle of the walls. 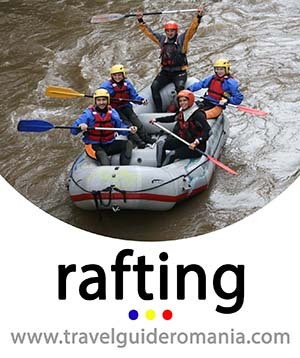 The uproarious course of the water creates waterfalls, huge potholes and several underground tunnels which give this region a feeling of unmatched wilderness. The Galbenei Valley has its origin in a source that is specific to the karst relief: a karst spring, Izbucul Galbenei (the Yellow Karst Spring). 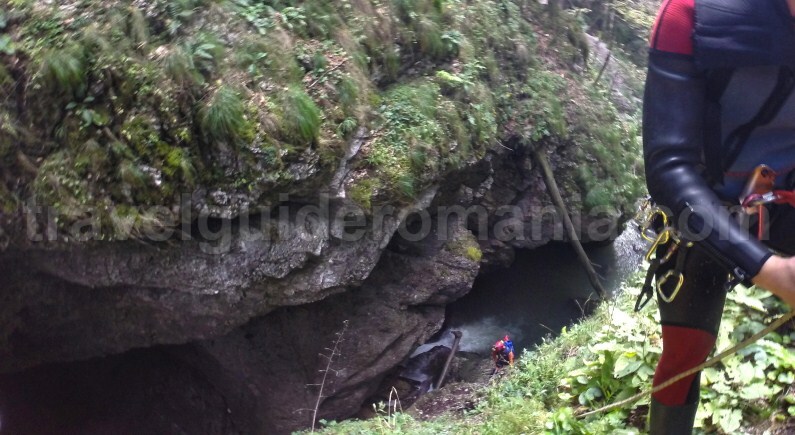 The Galbenei Karst Spring is located at the bottom of a large rock wall. It’s a small lake, 4 or 5 meters (15 feet) wide, which is supplied with water from below. The flow is enormous, as the water which escapes the lake forms a big and gusty river. This is the water comes from the drainage into the underground of the whole closed basin of Padiș and Cetățile Ponorului. The Galbenei Valley is part of a large morphological complex made up of Izbucul Galbenei (Yellow Karst Spring), Valea Luncșoarei (Small Meadow Valley), Cheile Jgheabului (Trough Gorges), Valea Seacă (Dry Valley) and all the drainage basin up to the confluence with Crișul Pietros (Stony River). Downstream from the confluence between the Galbenei Karst Spring Valley and the Small Meadow Valley starts the Galbenei Valley. From the left, it receives an important tributary: Dry Valley. That is the main tributary of the Yellow River and it deserves a very special mention: upstream from here you can find the well-known erosion phenomena – Groapa Ruginoasa (The Rusty Hollow). 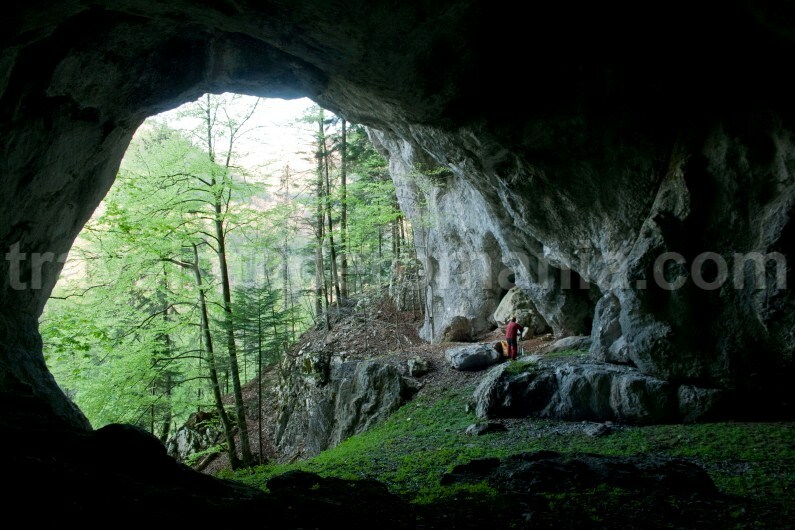 In the Galbenei Gorges there are 93 caves. 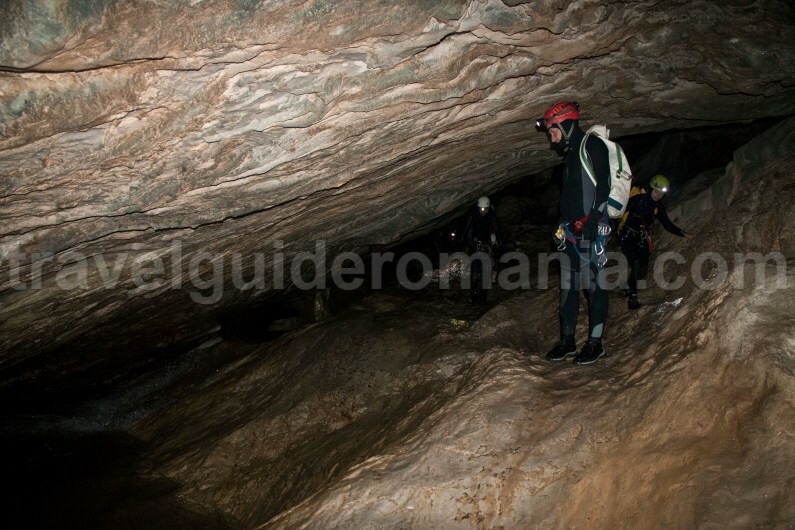 The most important of them are Vârseci Cave and Peștera cu Aluviuni (The Cave with Sediments) the last being 448 meters long. 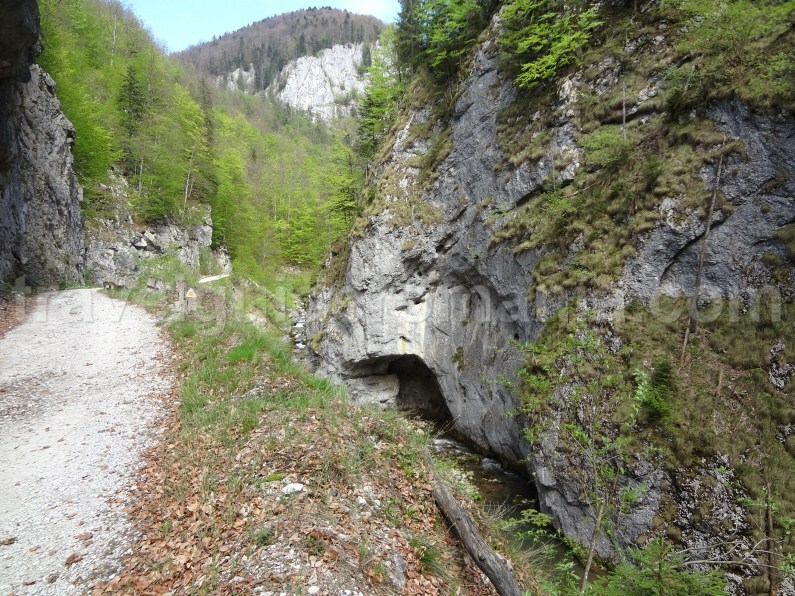 You can enter the Galbenei Gorges from Poiana Glăvoi (Glăvoi Glade), following the yellow trail marking. 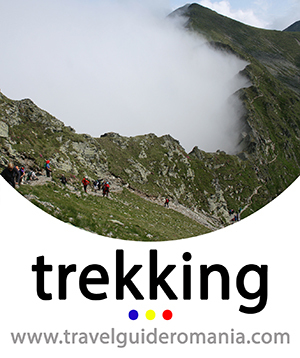 The route, which is accessible only for tourists in good physical shape. 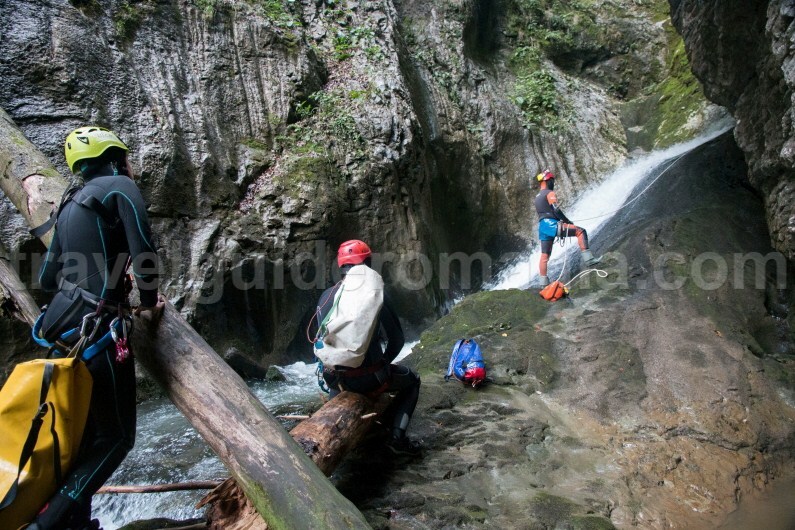 It allows the coverage of the Galbenei Canyon on the section from the access road from Boga up to the Fan Waterfall using 3 via ferrata passages. The passages are equipped with steel cables for hands or feet. Their lengths vary from 20 to 100 meters. 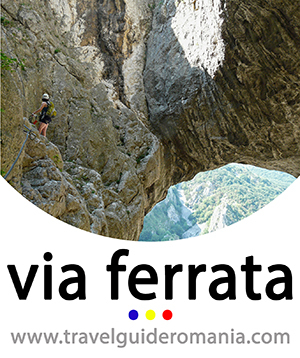 The via ferrata sections are quite hard to cover because the humidity of the valley makes the rock and the cables slippery. We do not advise you to try this route with children which do not have an athletic constitution (strong muscles). 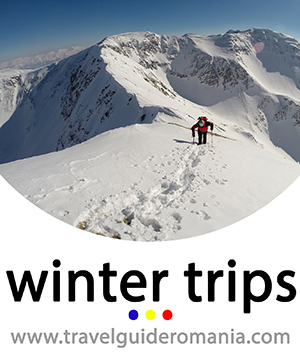 It is forbidden to cover this route during winter time, during periods of high level waters or flash floods, as there is a risk of serious accidents. 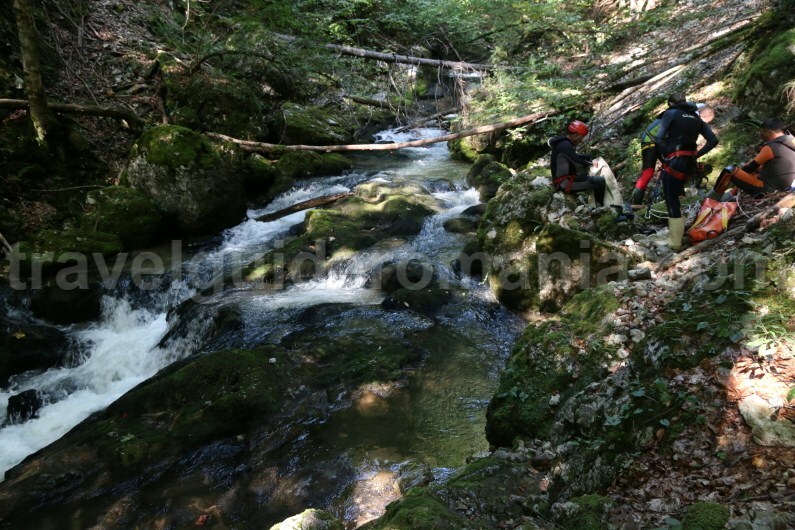 You can reach the Galbenei Gorges from the road from Pietroasa to Boga. Follow the forest road that climbs to Luncșoara forest range. 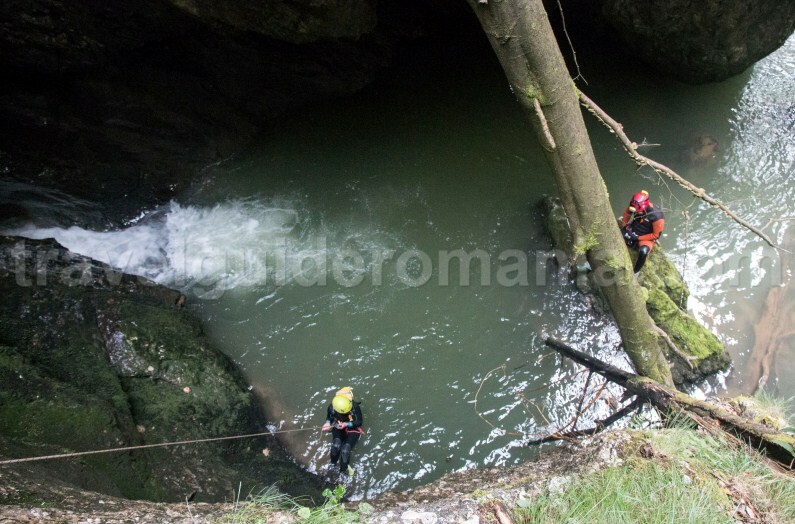 The advantage of the access from Boga – Crișul Pietros (Stony River) is that, in case you want to do some canyoning in the Galbenei Canyon, you can bring the equipment by car. The logistics of the trip will thus be easier. 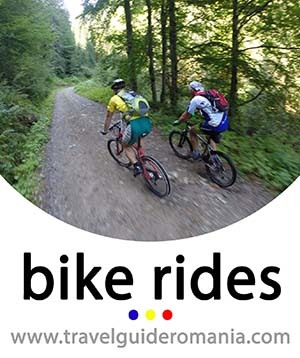 Instead, the distance is longer, about 15 kilometres (9 miles). 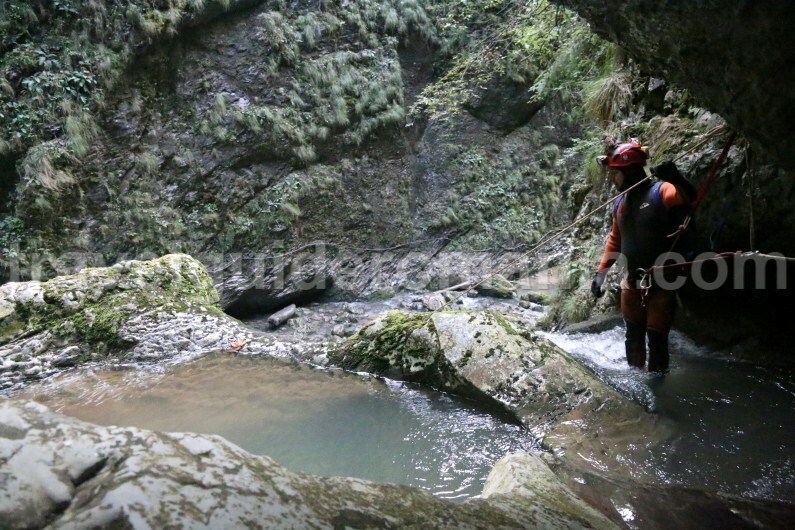 Canyoning in the Galbenei Canyon – Although the canyon has only 9 waterfalls, the difficulty of crossing comes from the high flow of water even in summer time. As the water that flows in the Galbenei Valley comes from underground, from the Galbenei Karst Spring after a long subterranean travel, its temperature is quite low. 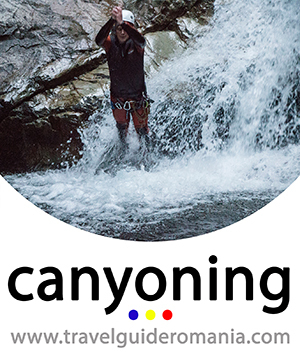 Recommended period for canyoning: due to the high flow of water, the canyon can be covered only in periods of low precipitations. 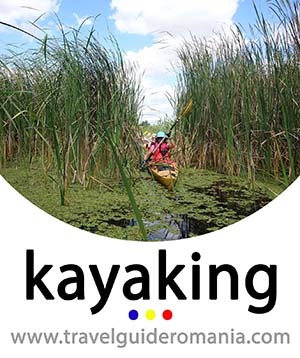 Necessary personal equipment: full wetsuit (trousers, jacket with hood, socks, gloves), helmet, harness with lanyards for security, descending device. 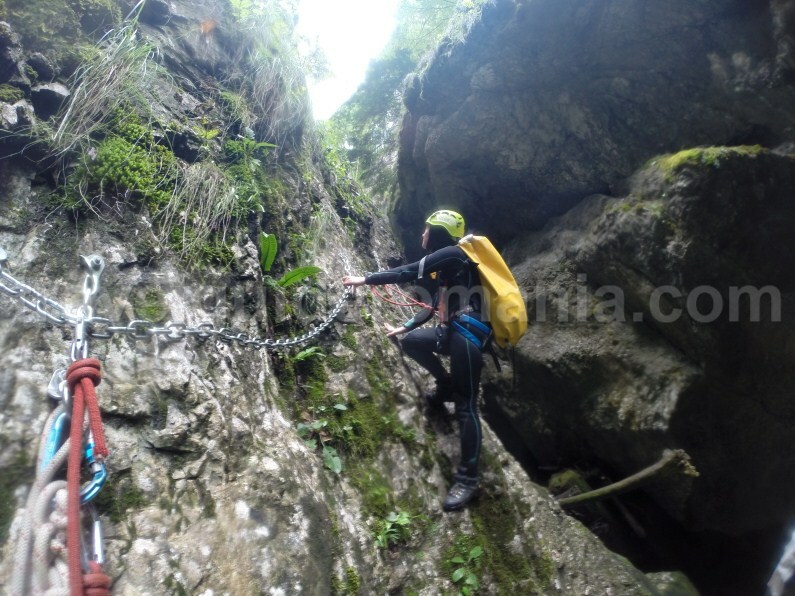 Necessary group equipment: 25 meter rope, 40 meter rope, quickdraws with screw-lock carabiners, slings (at a waterfall you will use a tree as mooring), darren drum, first aid kit, packs for carrying the rope. 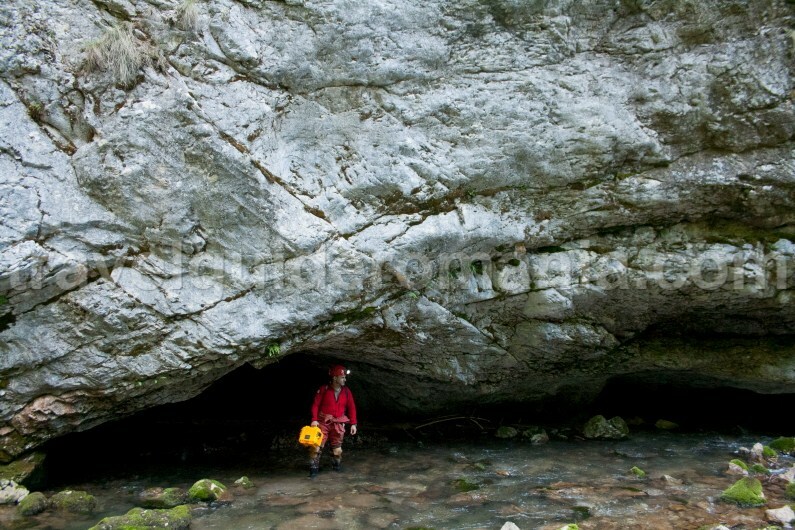 It is very important that the packs for transport in the canyon should have holes at the bottom so that the water will not accumulate inside. 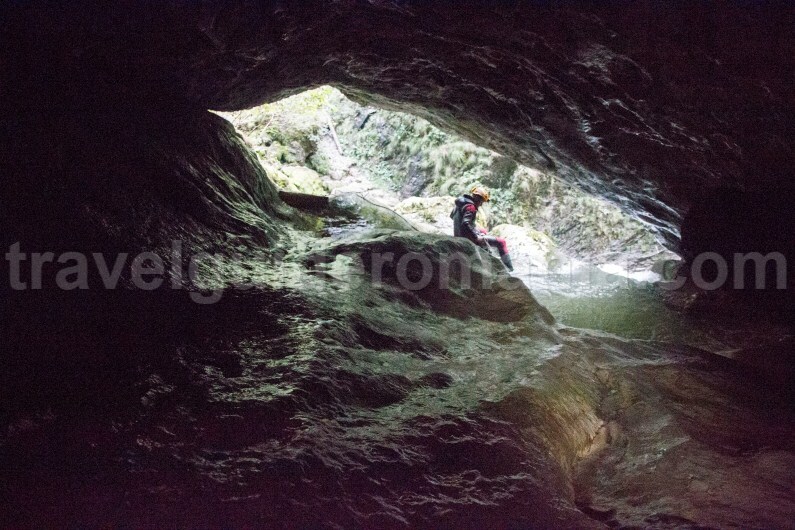 You can enter the Galbenei Canyon by descending from the Galbena Karst Spring in the valley until you find the first potholes. 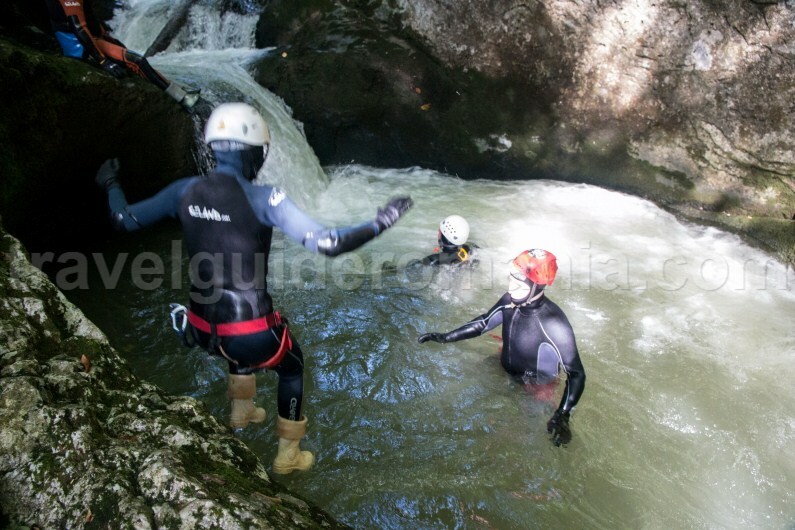 There you can get your canyoning equipment on. Waterfall 1 – it is 2.5 meters (8 feet) high. At the bottom there is a pothole that you can jump into. Usually, people jump from the right side. If you jump into the pothole from the left side, the height is bigger, up to 6 meters (20 feet). Don’t forget to check the depth of the pothole before the first person jumps into the water. 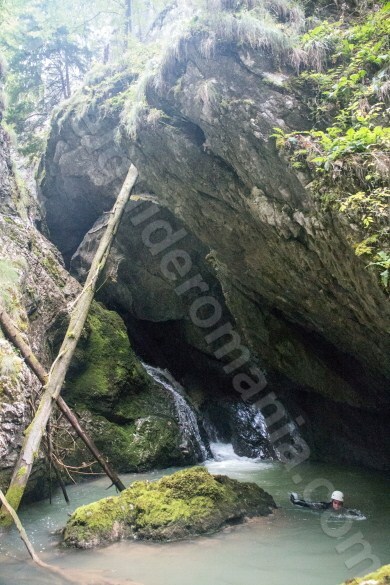 Waterfall 2 – it is 6 meters (20 feet) high and has the shape of an inclined plane. The traverse line starts from the left versant. For mooring, there is a chain with plates and ring. The traverse line has intermediary moorings. You will have to traverse the valley in such a way as to reach the left versant. 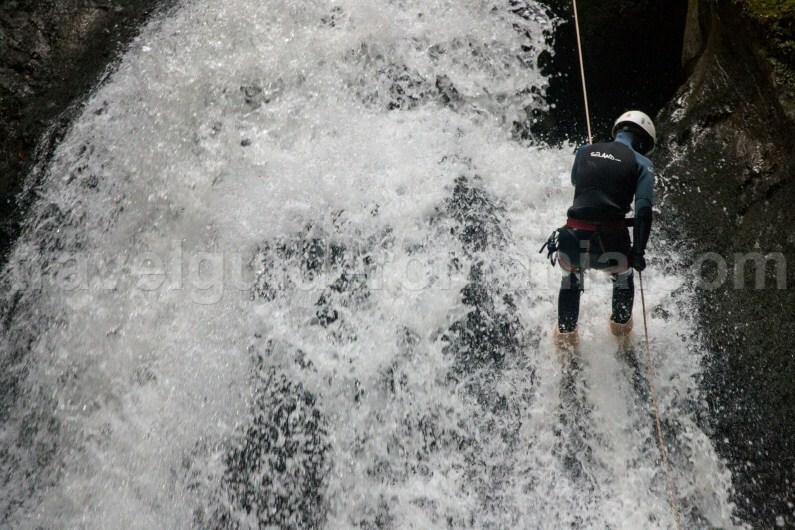 On the rope for descending we reach right at the head of waterfall no. 3. Waterfall 3 – it is 4 meters (13 feet) high. Caution! 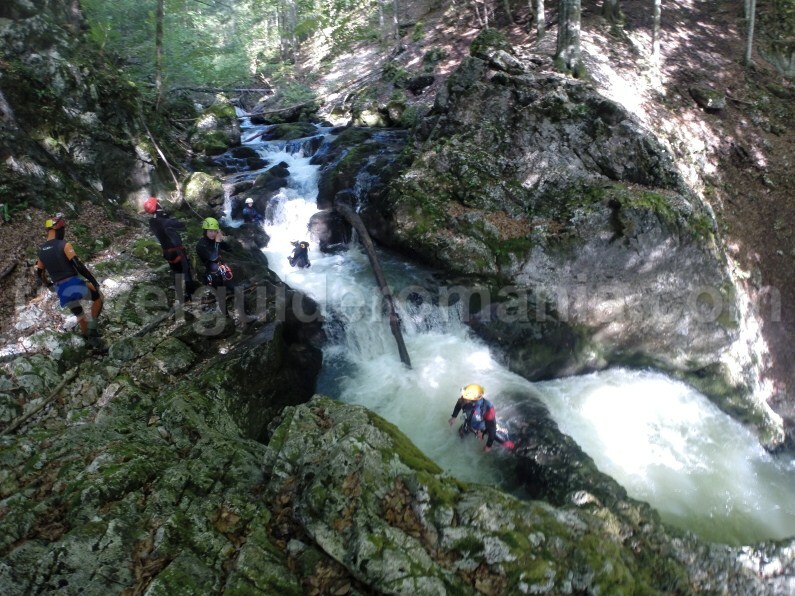 The descent leads you straight through the water stream. If there is a high flow, it can be dangerous, as the water pushes you into the pothole. 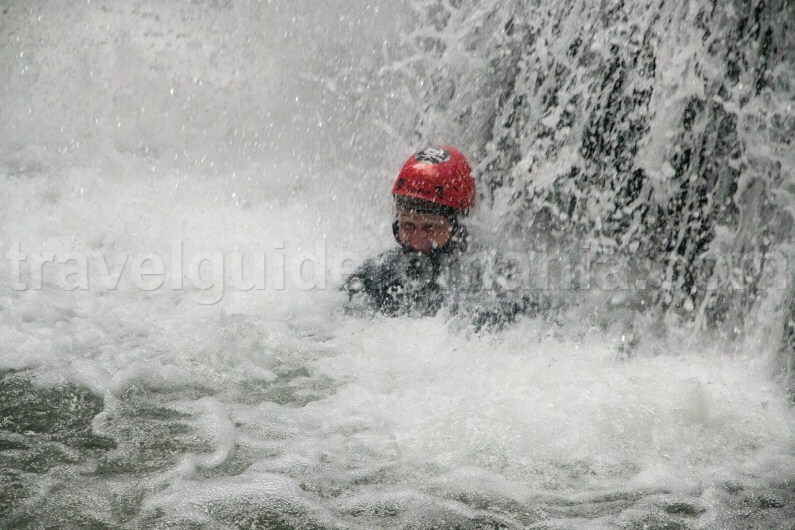 The first person to descend should be a good swimmer. Do not hesitate to help your team members. 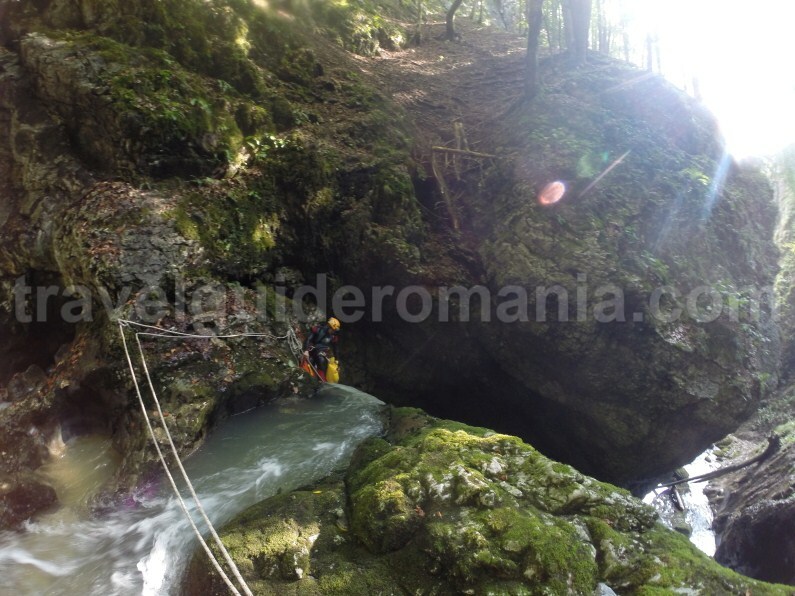 We recommend that the second person to descend should install the rope for the next waterfall (4 meters – 13 feet). In the pothole there is space for 3 persons at most. The water current is very strong. 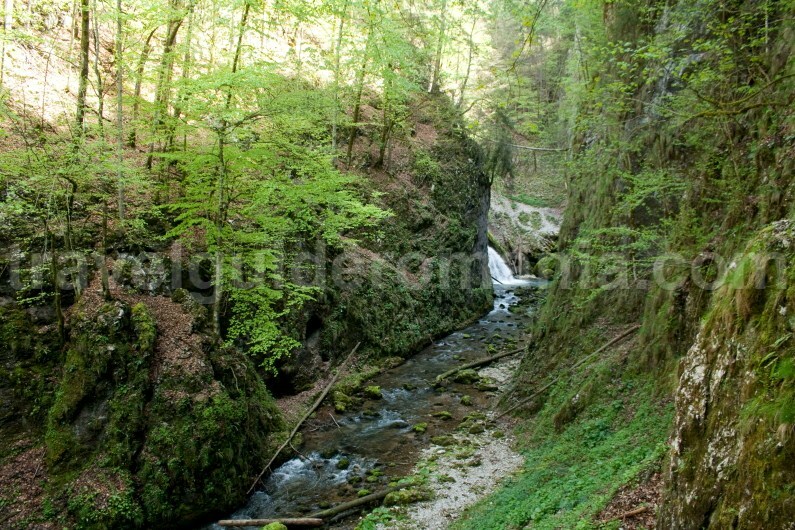 Waterfall 4 – it is 4 meters high and has the shape of an inclined plane. 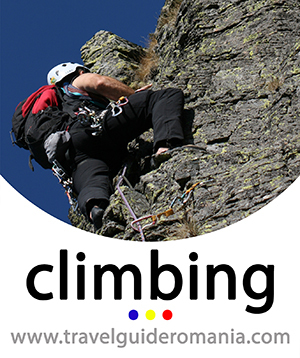 You can descend it easily, without any problems. You can regroup at the bottom of this waterfall. 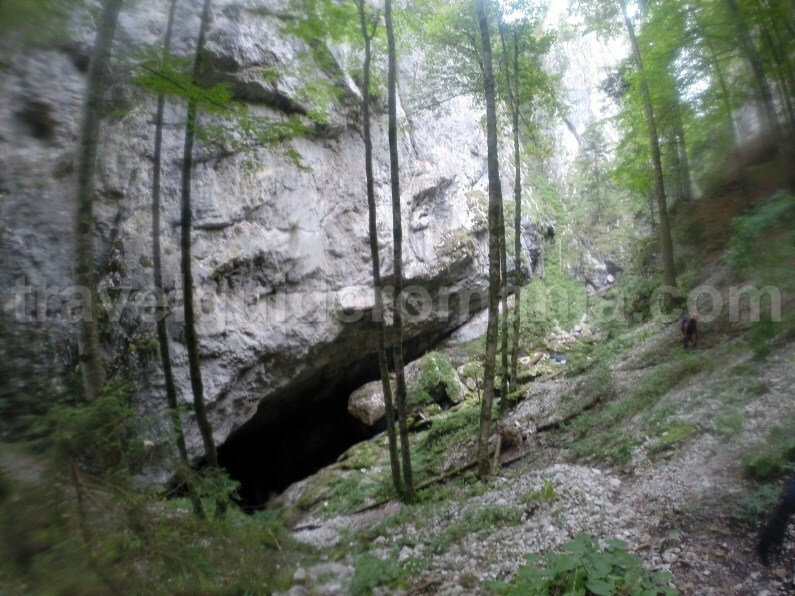 Next, there is a passage through the valley on a distance of about 100 meters. You have to climb an inclined plane on the right versant, where you have to install a traverse line. The crossing till the head of the waterfall is quite exposed without a rope. 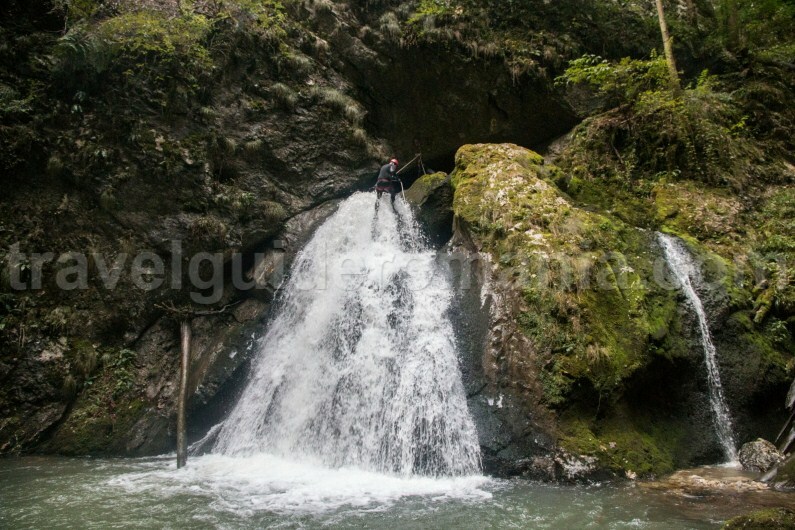 Waterfall 5 – it is 14 meters (45 feet) high. The head of the waterfall has to be installed from a tree. The rope we descend on will lead us to the next waterfall head. You can descend in parallel with the water, without any direct contact. Waterfall 6 – it is 10 meters (32 feet) high. There is a vertical descent of 5 meters (16 feet), followed by a regrouping point on an installed metallic platform. After that, you can descend on the rope or jump from the platform. The pothole at the bottom of the vertical is very deep. It is recommended to check the depth of the water because it may bring logs or boulders during flash floods. If you want to jump more than once, you can do it easily, as you can return to the platform on a path. You can secure yourself from the metallic chain that is installed there. 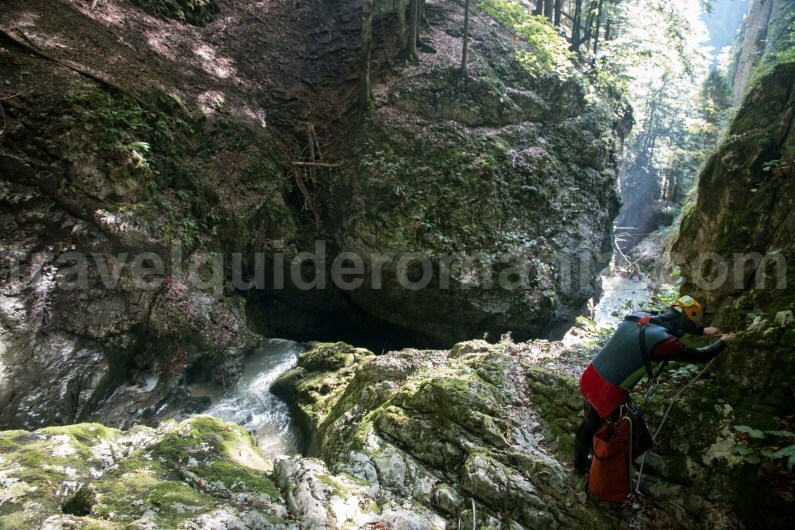 Waterfall 7 – it is 15 meters (50 feet) high and requires a descent through the first entrance of the tunnel that you will find by descending the valley. As waterfall head, in the past there was a fallen tree that could be used. When the TGR team crossed the canyon (October 2015), the tree wasn’t there anymore and the descent could not be made. Waterfall 8 – it is 8 meters (25 feet) high. You can jump into the pothole. Take care at the water current, as it is very strong. Next, there is an 8 meters long toboggan, then we cross an area with potholes. In order to cover this section of the canyon you need a light source, as you are inside a cave. Following the water stream, you reach the waterfall no. 9. Waterfall 9, aka the Fan Waterfall, is located on the tourist circuit of the Yellow Gorges. The head of the waterfall is installed at the cave exit. 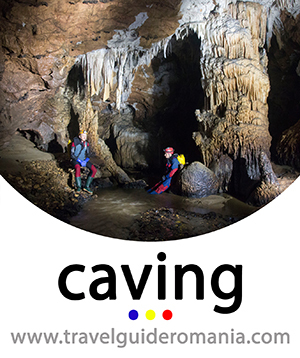 The head of the traverse line is a ring located at about 6 meters inside the cave. The waterfall is 8 meters (25 feet) high. 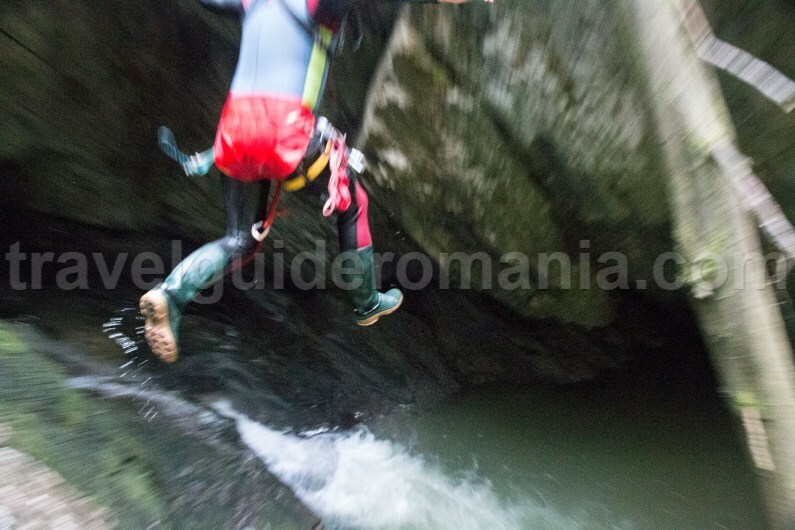 After a descent of about 3 meters (10 feet), you can jump into the pothole at the bottom of the waterfall.